Last summer I not only conquered my childhood fear of making Friendship Bracelets, but I also developed a new appreciation for them. They’re simple to make and cute as a can be, but most winningly, they really are great tokens of friendship. So cheerfully reminiscent of childhood and its open declarations of best-friends-forever, friendship bracelets are such a super way to let someone know you’re thinking about them. 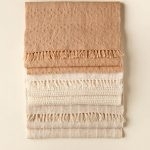 All this adds up to the perfect Valentine’s Day project! How sweet would it be to show up to work or school on February 14th with a bunch of these lovely little expressions of affection? This time around I was a little more ambitious, creating adorable patterns of hearts and arrows, perfect for the holiday! Also, instead of traditional embroidery floss, I used Koigu Premium Merino Needlepoint Yarn, and I may never look back. Not only does this 100% merino wool come in a stunning array of hand-dyed colors, but its soft elasticity actually makes it easier to work with than the cotton. 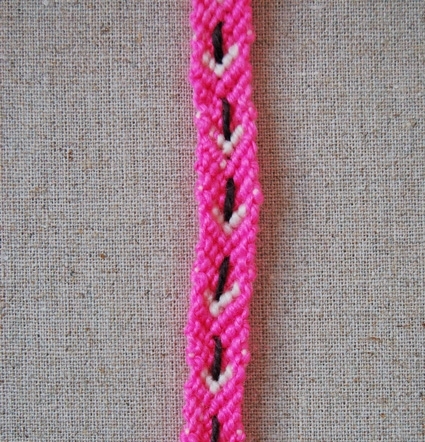 Plus, when you’re done, you can press your bracelet so it lies totally flat with a beautiful drape. 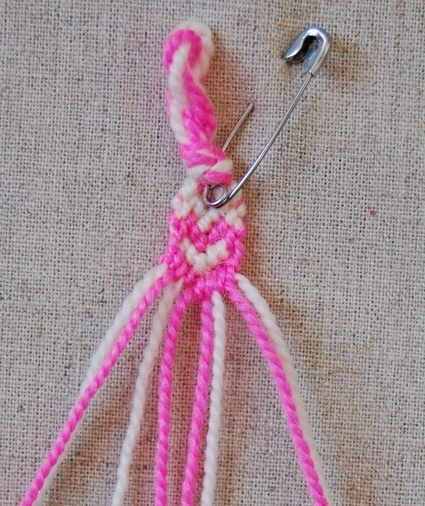 If you’ve never made a macraméd friendship bracelet before please check out our original Friendship Bracelet post to learn how to make a left knot and a right knot. a blunt embroidery needle to take out any mistakes. Cut two 72-inch lengths of color A. Color A will be the ecru yarn in the pictures above. Cut two 72-inch lengths of color B. Color B will be the pink yarn in the pictures above. Gather all of the cut pieces together and fold them in half. Tie a simple overhand knot at the fold, leaving a 3/4-inch loop. You will now have 8 total strands, four of each color, originating from the top knot. 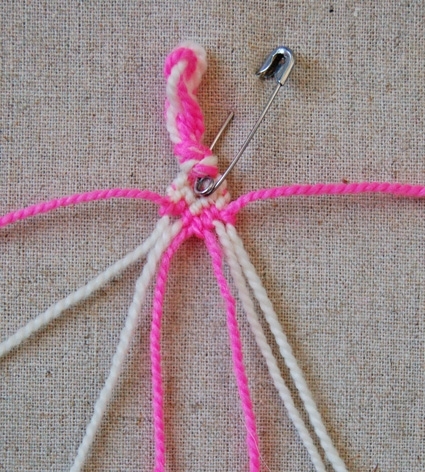 Using the safety pin, pin the knot to a flat surface or your jeans. Arrange the threads in the following order: A, B, A, B, B, A, B, A as shown above. 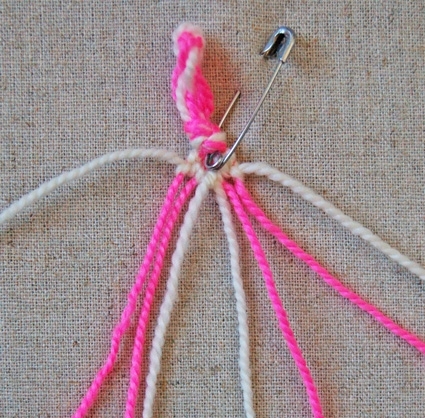 Starting at the left side and using the left most strand of color A tie a left knot. Moving from left to right and using the same strand of color A tie two more left knots, for a total of 3 left knots. 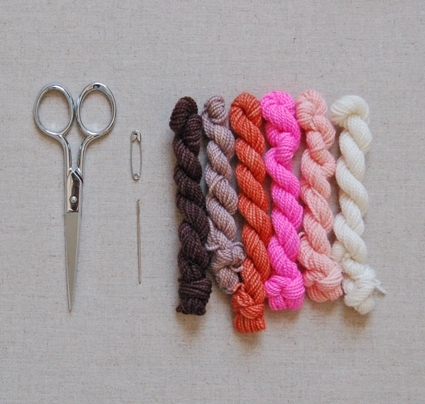 Using the right most strand of color A make 4 right knots. 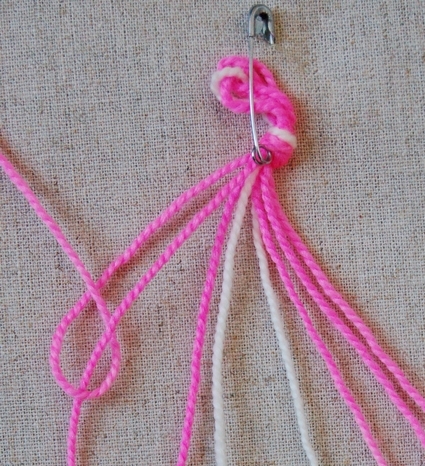 Using the left most left strand of color A make a right knot. 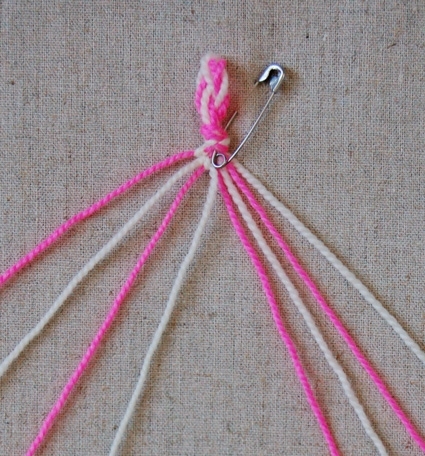 Using the right most strand of color A make a left knot. These two strands of color A will now be at the outer edges as shown above. 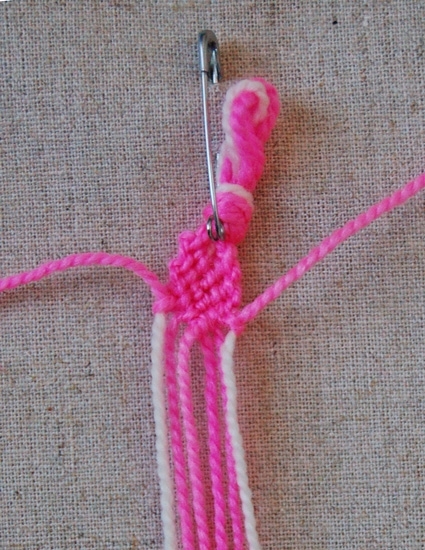 Using the left most strand of color B make two left knots. 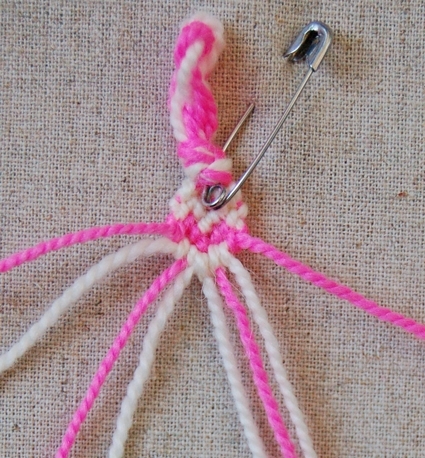 Using the right most strand of color B make three right knots. With the left most strand of color B make a right knot. With the right most strand of color B make a left knot. 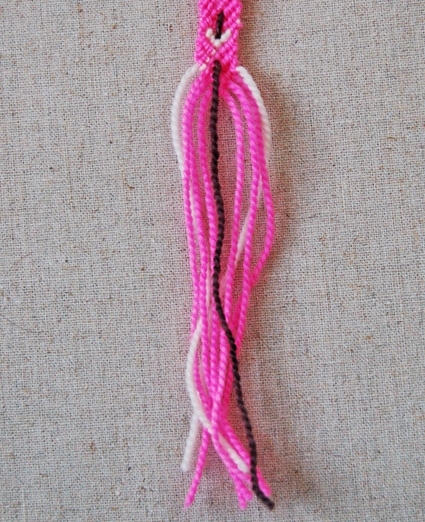 With the left most strand of color A make 2 left knots. 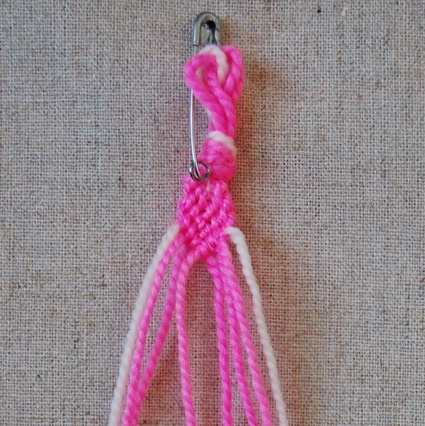 With the right most strand of color A make 3 right knots. 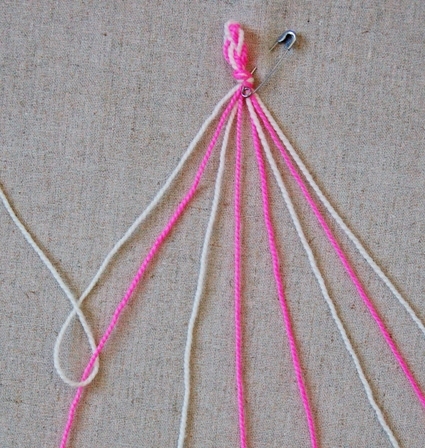 With the left most strand of color B make three left knots. With the right most strand of color B make four right knots. You will now have your first heart shape. 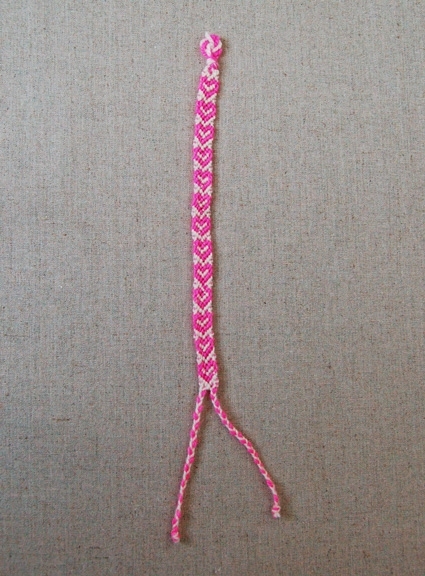 Repeat steps 1-6 until your bracelet reaches the desired length. Spray the bracelet with water and press it flat with a hot iron. Cut three 72-inch lengths of color A. Color A will be the pink yarn in the pictures above. Cut one 72-inch length of color B. Color B will be the ecru yarn in the pictures above. Arrange the threads in the following order: A, A, A, B, B, A, A, A as pictured above. 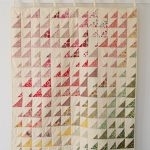 Repeat these two rows two more times, until color B is on the outside as shown above. 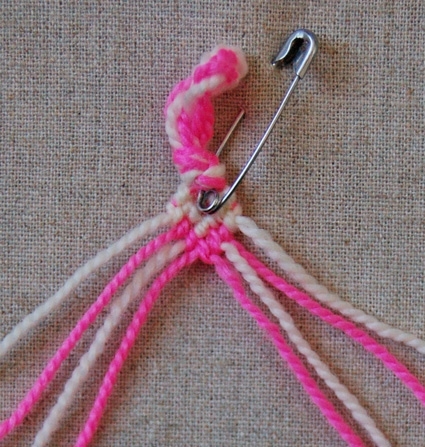 Using the left most strand of color A make a right knot. 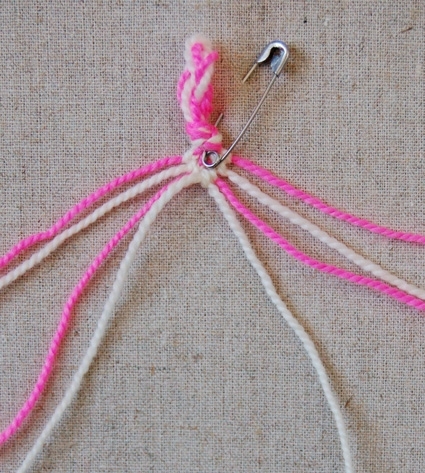 Using the right most strand of color B make a left knot. 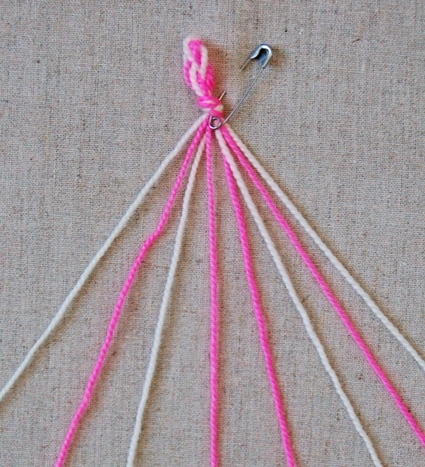 These strands will now be on the outside, as shown in the picture above. 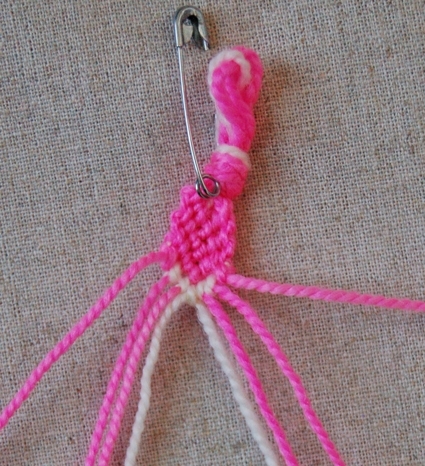 With the left most strand of color B make two left knots. 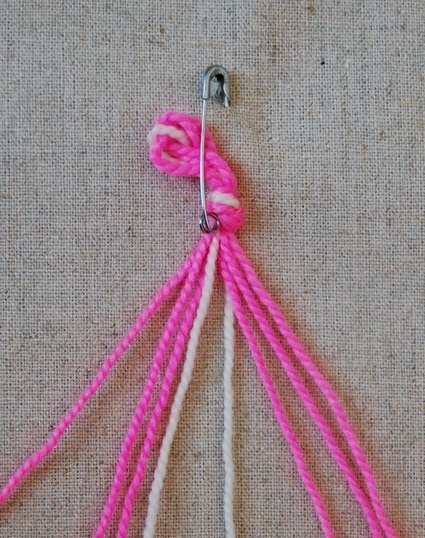 With the right most strand of color B make three right knots. 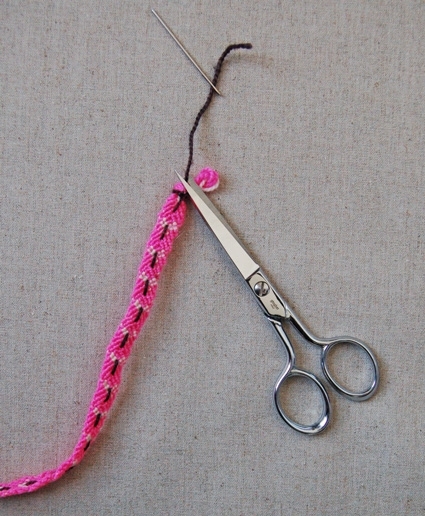 Repeat steps 1-3 until your bracelet it the desired length. 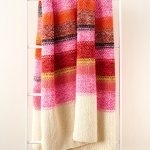 Cut a 20-inch length of color C and thread it onto the embroidery needle. Pull it through the top knot and from the back of the bracelet to just above the first arrow head as shown above. 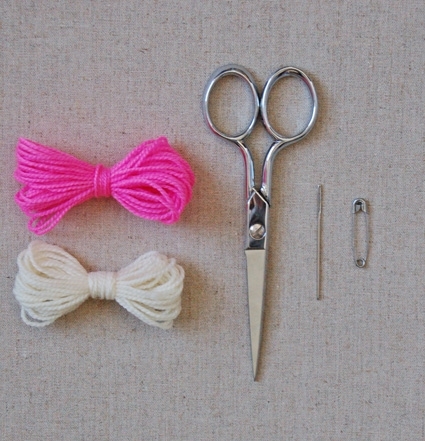 Leave a 4-inch tail of color C and tie this tail to the top knot with a double knot. Using a large running stitch embroider the arrow bodies above each of the arrow heads as shown above. 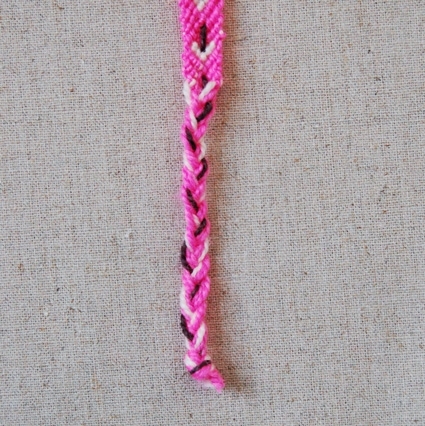 Embroider them all the way down the length of the bracelet. At the end cut all of the yarn ends to the same length. Make sure the top double knot of the color C tail is secure. Thread the tail through the embroidery needle and push it through the top knot once again then cut off the tail at the exit point to hide it. 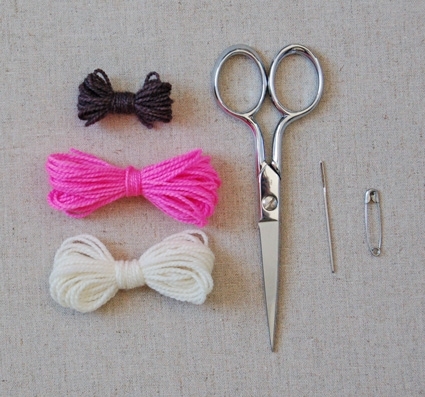 Braid the end strands, tie them in a simple overhand knot and then trim the ends. I used to love making these during class in school. But mine weren't as pretty as yours! Thank you for reminding. I still have so much yarn I could use. Love the pink hearts! Just right in time! 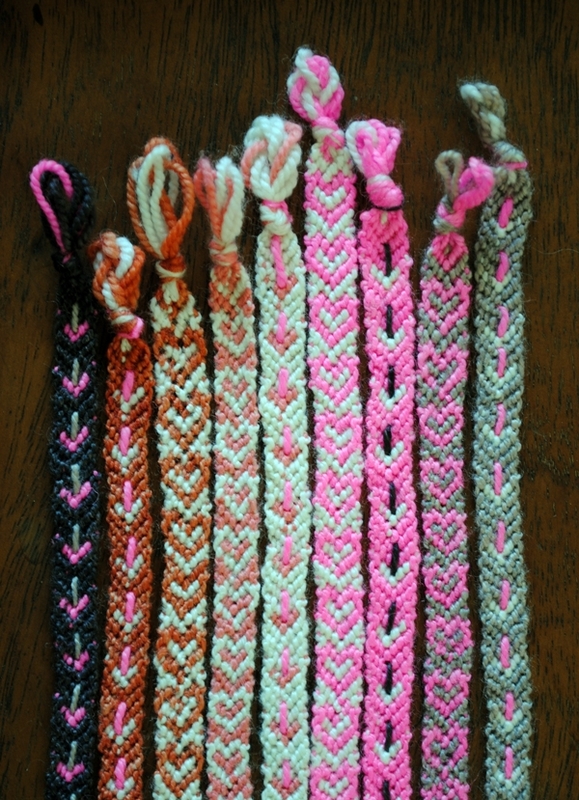 Last evening my daughter asked me for making bracelets with her. Your´s are very beautiful and I think we´ll make some of them too. Wow, this brings me back. I used to make these all the time as a kid. So cute!! I'm trying this pattern out right now and I realized that there was a step omitted between steps 4 and 5 (to make the inner white of the heart). I believe it should be 2 left knots using leftmost color A and then 3 right knots using rightmost color B. Thanks for such a great pattern; I haven't done macrame in years! Thank you so much for bringing this to my attention so quickly! There was indeed a step missing I just fixed the pattern so it should be correct now. these are beautiful!! but your patterns are a bit vague and hard to follow. one thing that would make it a whole lot easier is to put the picture at the end of each step. it is very confusing at the beginning of each step. Sorry to hear you're having trouble following the patterns. Putting the picture first is how we write all of our patterns. You might want to shrink your view so you can see the photo and the instructions at the same time. 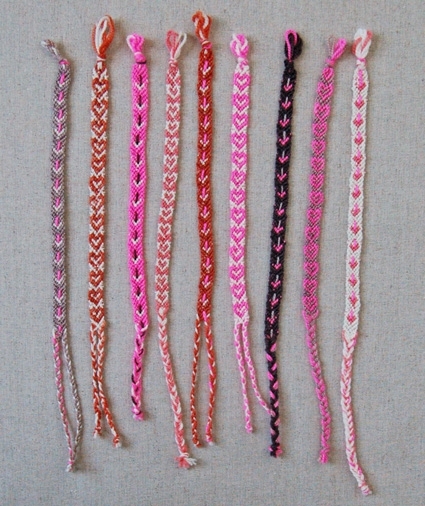 It also might be helpful to read the previous friendship bracelet post which can be found here: http://purlbee.squarespace.com/friendship-bracelets/ It explains things in more detail. Hope this is helpful. Thanks for your comment. 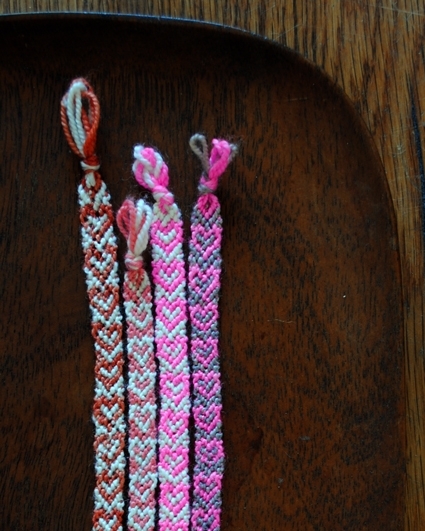 These little bracelets are very cute. 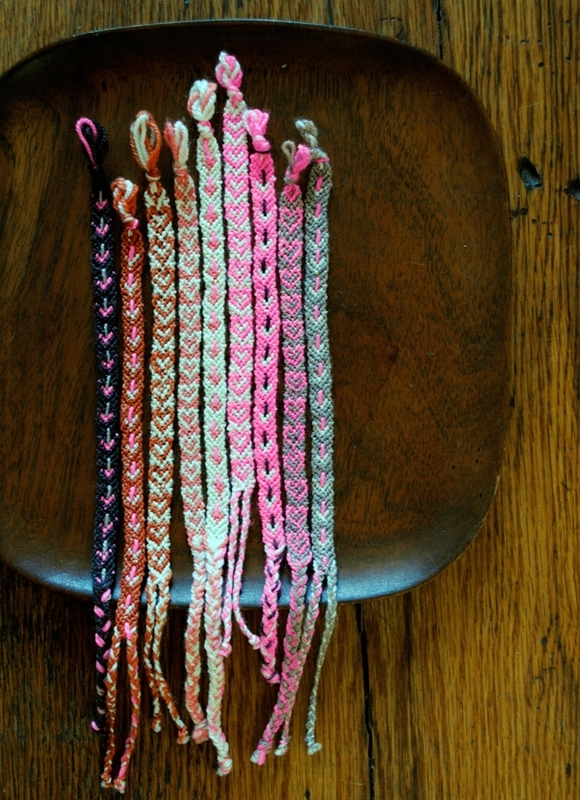 Alas, I am afraid I don't know much about friendship bracelets, and I can't tell how they would be worn. I am a grandmother from another era — but I think I would like to try my hand at making some of these for some of my grand-daughters. But first – I would really like to know how to take the flat bracelet to one worn on the wrist. Any further instruction would be appreciated. You wear them by threading the braided end(s) though the top loop and tying a knot. Many times the knots are permanent and you just wear the bracelet until if falls off (or you cut it off). 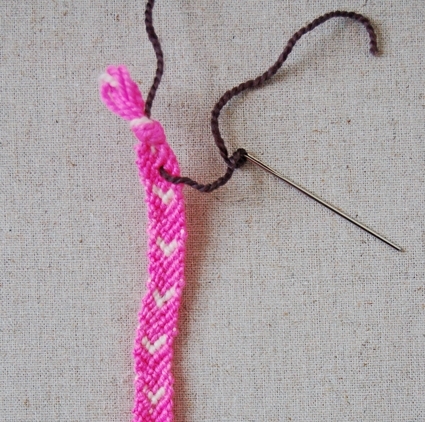 But if you finish it with the two braid option, shown on the heart example, you can tie a bow through the loop so the bracelet can be taken on and off. I hope this helps. Thanks for your question. 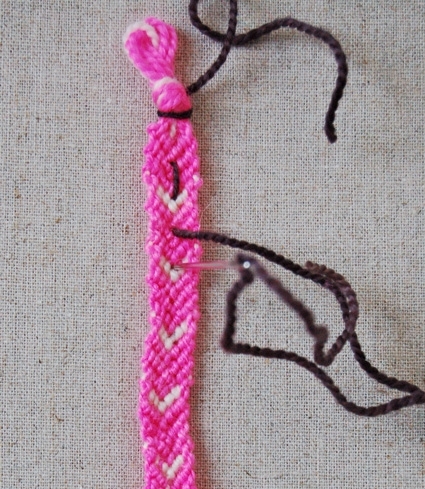 Yes, the left and right knot always consist of 2 knots, in any friendship bracelet pattern that we post. The pictures in this post show where the threads need to be after each step. Is there a particular step you're having problems with? If this is your first foray into macrame bracelets you might want to start with one of the easier bracelets from the previous post, like the stripes or chevron. Thanks for your question and please do let us know if you need any more help. Wow this takes me back. Thank you so much for reviving the young girl inside me! 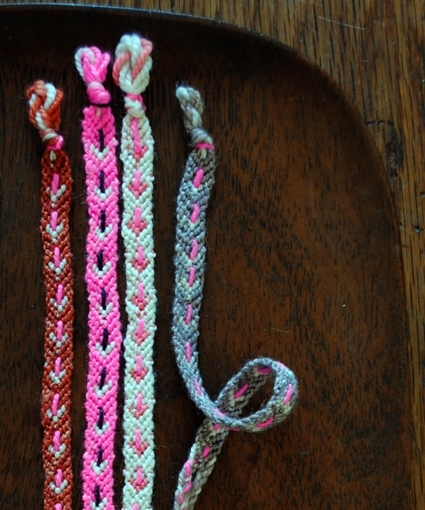 Thanks for sharing this super cool tutorial – the photos are great and the instructions are really clear – takes the fear out of making friendship bracelets! The idea is so cute, and I can't wait to make one for all my girlfriends. I have tried and tried to make these myself and they never turn out right. Would you ever consider making and selling them lol?? If you are tying more than one left knot you will always tie them left to right. So in step 3 you should tie the first left knot to the strand directly to the right of the working yarn and the second to the right of that. I hope this is helpful. Please don't hesitate to contact us with any more questions. I just wanted to share a tip that I don't think I've seen anywhere online. Instead of pinning the loop to your jeans (and this is helpful as you may not be wearing jeans, lol) or tossing the loop over a toe (yes, we did it this way at camp… I only wish I were still so flexible!) I figured out that using a regular 8.5″ x 11'' (or bigger, or whatever is comfortable) clipboard** works best for me. Just start off by making your loop, then catch the knot *directly* behind the clip of the clipboard. If your first few rows aren't starting close enough to the knot or if you are making an especially wide bracelet you may want to clip the loop side of the knot (it won't hold as tightly, but will be fine if you don't yank too hard) for the first few rows of stitches, until you have enough bracelet that it's flat and showing and *then* clip on the bracelet side of the knot. 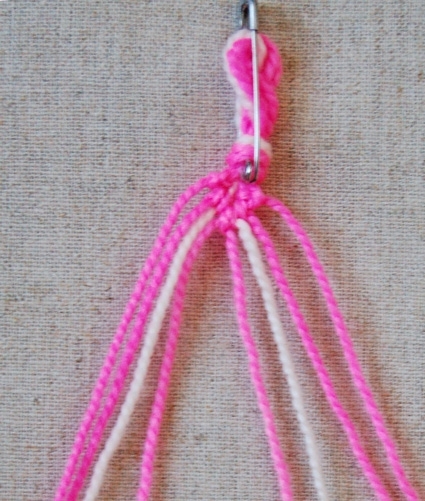 This helps you create the most comfortable posture for knotting and keeps your project neat and portable. I think it helps make better knots because it keeps the tension consistent. **If you don't have a clipboard, you could probably fashion one with one of those black clip paper fasteners (what are those called?!?) and clip it a piece of cardboard or maybe even a sturdy magazine. love these little gems but I still don't think this pattern is correct. The inner part of the heart does not come together as instructed. Has anyone else had trouble with it? Thanks a bunch. The pattern is correct. What does your inner heart look like? I tried the heart bracelet 3 times and got it wrong very time. I finally figured out what I was doing wrong! I kept using the outer strands I'm Step 3 when they should be left alone and the left and right knots should be made only with the remaining middle strands. I think you should clarify this in the directions for us newbies to friendship bracelets. Thanks! I tried making this bracelet with appleton wool since it was the only needlepoint wool I had. I dont know if this happens with the koigu, but the bracelet has an elastic quality – i can stretch it and it will bounce back. 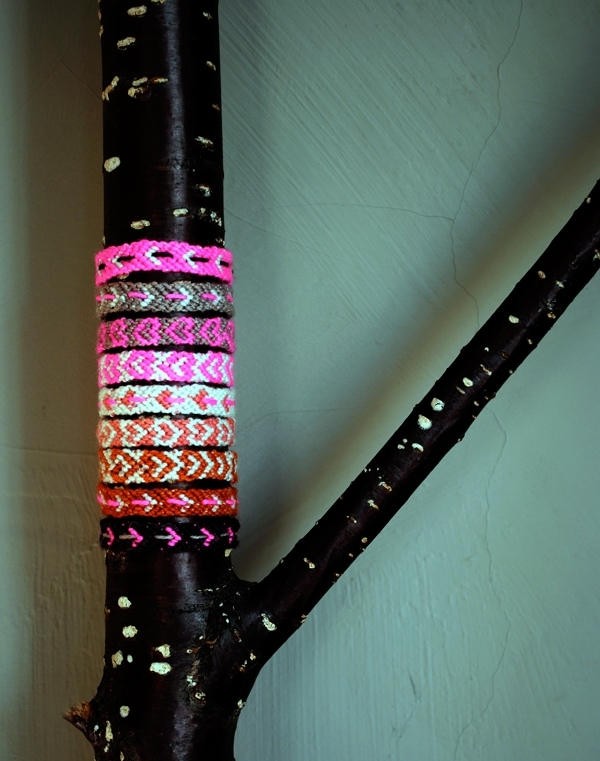 Pretty handy for a bracelet – you can knot it permanently and easily take it on and off!